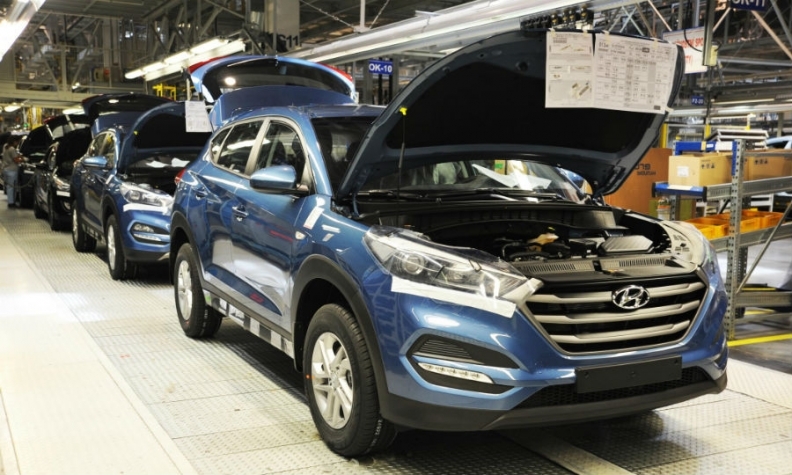 Tucson production is shown at Hyundai's Czech factory. Demand for the SUV, which launched in Europe in September, helped the factory to beat its target. PRAGUE (Reuters) -- Hyundai Motor's Czech unit aims to boost output by 2.3 percent to 350,000 cars in 2016 after beating production targets last year. Production rose by 11 percent to 342,200 units in 2015, 3.7 percent above the factory plan. The plant in Nosovice builds the Hyundai i30, ix20 and Tucson models, according to Automotive News Europe's latest European Plant Assembly Map. Hyundai's Nosovice facility is one of four car factories in the central European country along with two Skoda plants and a PSA/Peugeot-Citroen factory. The car sector is a major economic driver for the Czech Republic. The country's industry association estimates Czech car production reached a record 1.29 million in 2015, a rise of 3 percent.